What possessed me to sign up for the NYC marathon in 2006 and then again in 2013, I do not want to remember…but there I was – hundreds of hours of lonely training lay ahead of me until I discovered the many secrets of Central Park. I came to realize that there are no better places to run and train while experiencing one of the world’s most stunning public parks designed Frederick Law Olmstead & Calvert Vaux. Covering 778 acres, later expanded to 843 acres, the park was man-made in its entirety. I have not come to tire of the perspectival vistas, strategically crafted to enhance the visitor’s experience. Whether rain or shine, sleet or snow, Central Park is an oasis right in the middle of one of the world's densest urban environments. Here are ten secrets you may not know + my very own secret experience. Well-hidden on the on a steep cliff at the North End of main road near Warrior’s Gate at Powell Boulevard (7th Avenue) sits this block-like structure that dates back to the early 19th century. It serves as a clear reminder of New York’s past and is one of the last remaining fortifications, and was used to protect the city from the British army during the War of 1812. 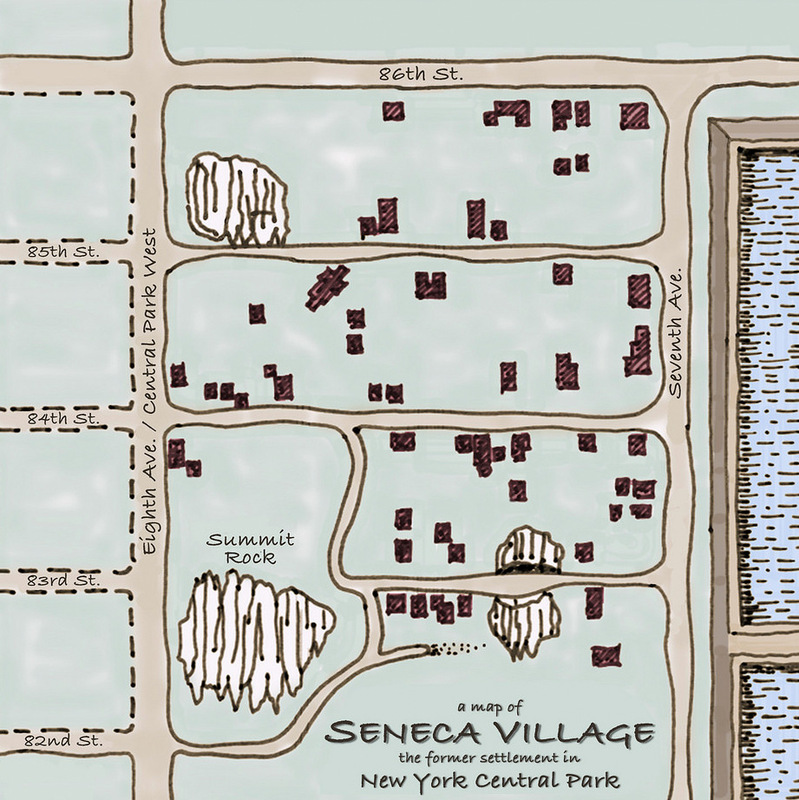 There was a life prior to Central Park: a thriving enclave called Seneca Village occupied the between 81st and 89th Street on the West Side, just east of Central Park West. This was a full-fledged middle class town with over 260 residents living in wooden houses on assigned lots with several churches and a school. However, in 1853 the city passed a bill authorizing the takeover of the land and paid the settlers off. By 1857, when the park officially opened, the settlement was gone. The footings of several building remain visible. Pets occupy big places in their owner’s hearts, even after they have passed away for many years. At Christmas time, they now have a place to share their pet’s love and affection with the world, albeit at a hidden spot. The existence of this tree is kept hush hush, yet somewhere in the park, they hang mementos on this impromptu Christmas Tree. Just below the East Drive of 67th Street, you can find another pet-lover’s favorite. The bronze sculpture of Balto celebrates a white Siberian Husky Sled-Dog who in 1925 delivered diphtheria vaccine to ‘Nome’ children in Alaska. Prior to the construction of Central Park, land-surveyors had laid out the city’s grid starting in 1811. Using iron bolts, they marked the corners of all the rectangles that would later become the corner of the New York City blocks. Yet the blocks never came to Central Park, hence the survey bolts were left behind. The exact location is kept a secret for fear that they will be stolen or destroyed. If you see it, leave it! One more deed by Robert Moses, NYC Parks Commissioner. In 1934, he sealed off this natural woodland area, preserving it as a bird sanctuary. For decades, the garden was left totally unattended and served as a sort of experiment, showing what would happen if one did nothing to maintain the land, until 2001. Conclusion: the area became a mess, chocking under overgrown invasive species, and the Conservancy began to restore it, reintroducing native plants, trimming back overgrown trees and re-grading the water’s edge. Named after George Harvey Hallett, Jr., a naturalist, birdwatcher and civic leader, the Conservancy gave the public restricted access to this nature sanctuary only in 2013. Today, they constantly tend to the plants, birds and butterflies, and finally opened the sanctuary to the general public earlier this year. Find it. When Central Park was built, the city planted more than 270,000 trees and shrubs and preserved a handful of trees that were original to the area. Today only about 150 trees are left from the time of Olmsted and Vaux, but many of the trees acquired over the years have a unique story. These Yoshino Cherry trees along the east side of the Reservoir may be the original trees presented as a gift to the United States by Japan in 1912. They are among the first trees to bloom in the spring before the Kwanzan Cherry. Mid-Park from 73rd to 79th Streets and west of the boat house, one can find a 38 acre woodland called ‘Ramble’, a quiet oasis from the busy city. Here Central Park is at its most naturalistic, with walking paths winding through the trees. Hidden within this wooden enclave, another secret; Ramble Cave also known as Indian Cave. It was created from a natural cave discovered during the park construction. It was accessible until the early 1900s when the cave was sealed off. It had become too dangerous to maintain and was a favorite hiding spot for the city’s transient population. Today, the entrance and the steps that lead down to the cave are barely visible from the path above. Where to find it: West shore of the Ramble, north of Gill Bridge and south of the Oak Bridge. Reverse history for both these features: Central Park's 55-acre Great Lawnwas NOT part of Olmsted's and Vaux's original design. Until the 1930s, it was the receiving reservoir for the Croton Aqueduct that brought fresh water into the city (see original plan). When the reservoir became obsolete, it was drained then filled with rubble from Rockefeller Center and the 8th Avenue subway, which were both being constructed at the time. The Jackie Kennedy Onasis Reservoir was indeed part of the original design and remained in use till 1993 when the city completed the city’s Third Water Tunnel. At first the city wanted to fill in it and was faced with massive protest, led by Jackie Kennedy Onasis. In 1994, the city reversed itself and renamed the reservoir in her honor. Here you can safely share a secret on this "Whispering Bench", strategically located within Shakespeare's Garden. Sit on one end of the stone bench and can whisper a message to your confident sitting at the other end of the bench. Just insure no unwanted by-standers are eavesdropping in the middle of the bench. Along the park’s northern end, villages had sprung up, and where there is a village, there is a school; Academy of Mount St. Vincent, established in 1842. Located next to the charming Harlem Meer and near 103rd Street, the Academy sat nestled amid a collection of hills and bluffs left over from its original topography. The school didn't last long and the original building eventually burned down in 1881. A tavern was then built, but that closed too. Today all that remains are the foundations and driveways. Just south of the Harlem Meer lies the six-acre formal garden, the Conservatory Garden. It is divided into three smaller gardens, each with a distinct style: Italian, French and English. The Garden's main entrance is through the Vanderbilt Gate, on Fifth Avenue between 104th and 105th Streets. The best kept secret is the northern section of the park. Most visitors don't make it up this far, but those who do will stumble upon some of the park's hidden gems including the waterfalls in the Ravine, part of the 90-acre North Woods. Olmsted and Vaux designed this section of the park including the man-made waterfalls to resemble the Adirondacks. There are at least five waterfalls in Central Park, all completely man-made, and most of which are located in the Ravine. The water that flows here is actually New York City drinking water that comes from a 48-inch pipe hidden by the rocks at the Pool Grotto on West 100th Street. Well: Let me share my own Central Park Secret: During one of my long training runs during the summer of 2006, I found myself at the parks north end - near collapse. I dragged myself off the black-top road and hoping the find refuge in the cooler shady forest only to stumble on these clear pools of water. Not thinking twice, I took off my shoes and dove into the water, only now learning this is NYC drinking water. Surprise – surprise came swiftly, when a Park Ranger with 20 French tourists in tow wandered to the waterfall only to find me floating in the pool. I am now featured in many French family photo albums, happily smiling and cooling. Take a walking tour of Central Park!